This cartridge is an illuminant round developed for use in the M120 and M121 120mm mortar system. It is intended for use in illuminating a desired point or area. 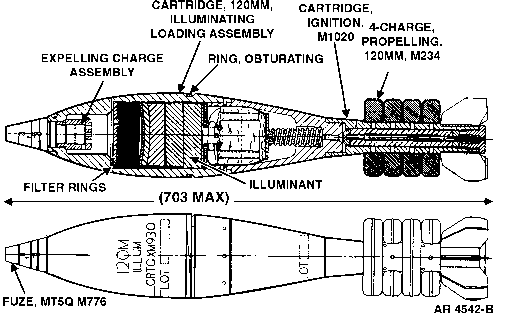 The complete round consists of a fuze, propellant charge, fin assembly, ignition cartridge, body tube, tail cone assembly, illuminant candle, and parachute assembly. The ignition cartridge has a percussion primer and is assembled to the end of the fin assembly. 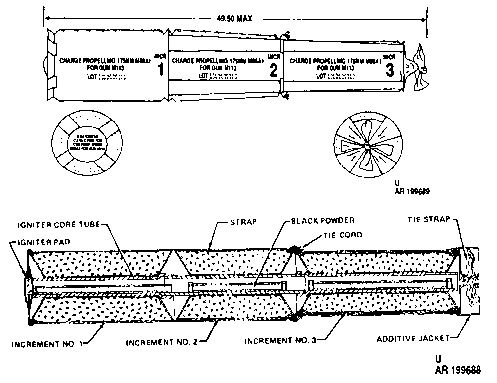 The propellant charge is contained in four horseshoe-shaped felt fiber containers and assembled around the fin assembly shaft. When the cartridge is dropped down the mortar tube, the firing pin at the bottom of the tube initiates the percussion primer and charge in the ignition cartridge. The charge in the ignition cartridge flashes through the holes in the shaft of the fin assembly and ignites the propelling charge. The gases from the burning propellant expand and propel the cartridge out of the mortar tube. The fuze functions depending on the fuze setting and ignites the expulsion charge, ignites the first-fire candle, and ejects the candle assembly. A spring ejects the parachute from the tail cone. Parachute assembly opens and deploys. The candle assembly provides illumination for 50 seconds.